...there is actually a town called Jerkwater. "Where are you from?" "Some little jerkwater town." "You mean, the Jerkwater?" Up until recently UPS somewhat arrogantly refused to deliver to PO Boxes maintained by USPS. Since many merchants use UPS, those businesses also refuse to ship to PO Boxes, blaming UPS (not always apologetically). 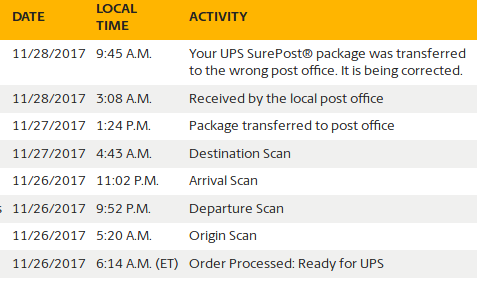 Lately it's gotten easier, with something called "SurePost," that hands off packages from UPS to USPS. It's amusing to read Daniel Albright's writings on Modernism -- brimming with enthusiasm and insight as if T.S. Eliot and Luigi Russolo were alive today and needed explanation -- alongside Jonathan D. Kramer's book Postmodern Music, Postmodern Listening (2016), which treats Modernism as a slightly tainted artifact of the distant past, deserving no sympathy or apologetics. In a series of posts we'll consider this incongruity. Kramer's book ultimately gets at the crux of why Modernism receives so many pejorative words in a current chart comparing it to Postmodernism: an intergenerational conflict based on the entrenchment of the Modernist canon in academia. It's one thing to study Modernist works, as Albright does; it's another to insist that this is the only correct art. In Chapter 1.7, "Why Today’s Composers Write Postmodern Music," Kramer notes that "some young composers are uncomfortable with pressures from their teachers to like and respect one kind of music (tonal) yet write another (atonal). Like adolescents in the world of postmodernism, they rebel against the values they learn in school. They want to create the music they love, not that which they are told to love." The atonal canon has been promoted in American academia not only by composers but also by theorists, who have found in the music of Schoenberg, Webern, Berg, Stravinsky, and Bartók fertile ground for their analytic studies. Music which lends itself to systematic analysis tends to be analyzed in universities more readily than that which does not, and the music which is often analyzed is the music that students naturally are expected to think of as the most significant and relevant.... Their modernist teachers reinforce these imitations with praise and encouragement. And why have theorists concentrated on this small body of music? Part of the reason is expediency: it is easier to analyze consistent music than pluralistic music, in which no one system of thought will explicate an entire piece. Another part of the reason is political. When theories of atonal analysis began to spread through academia, this music was already well entrenched, thanks to several influential progressive modernist composers who held major teaching posts. Theorists were thus able to assure their own importance by providing keys that unlocked the secrets of this highly valued but little understood repertory. Audiences have come around to some modernist music (such as the early ballets of Stravinsky, the quartets of Bartók, and the sonatas of Ives), but the compositions of the Second Viennese School still fail to attract a large public. The reason often given is the unrelieved dissonance in the music of Schoenberg, Berg, and Webern, but I doubt that this is the whole story. There is also a lot of dissonance in those Stravinsky and Bartók works which have found audiences, as there is in some downright popular Ives compositions, like his massively dissonant Fourth Symphony. Is the reason, then, atonality? I think not. The Rite of Spring, for example, may use some tonal materials, but it is not tonal. Stravinsky’s neoclassic works, which come closer to tonality, are less widely appreciated than the Rite. Schoenberg’s tonal works, such as Pelleas und Melisande and the Suite in G, are no more accepted by the public than are his atonal compositions. It seems that Schoenberg’s musical values and personality, more than his use of atonality or tonality, put listeners off. Is the reason for the gap between modernist music and the general public, then, the alleged lack of emotional content (whatever that vague term might mean)? Again, I think not, because some of Schoenberg’s most hermetic scores are also his most emotional (or so they seem to me). I think the main reason why some of the modernist works most prized by academics have little audience appeal is their elitism: you need to be a sophisticated listener to understand Stravinsky’s Symphony in C, or Schoenberg’s Fourth Quartet, or Webern’s Orchestral Variations. You need to learn how to listen to these works. They are an acquired taste. Whatever the reasons for the failure of audiences to enjoy much modernist music—and the failure of most modernist composers to write music capable of appealing to a large audience—modernism’s hermeticism has become almost a badge of honor. Late modernists, adopting a defensive posture, often act proud of the inaccessibility of their works to a general public. No pandering to the masses for them! No compositions with easily discernible structures! No postmodernism!